You want less clutter in your life. So do your friends and family! 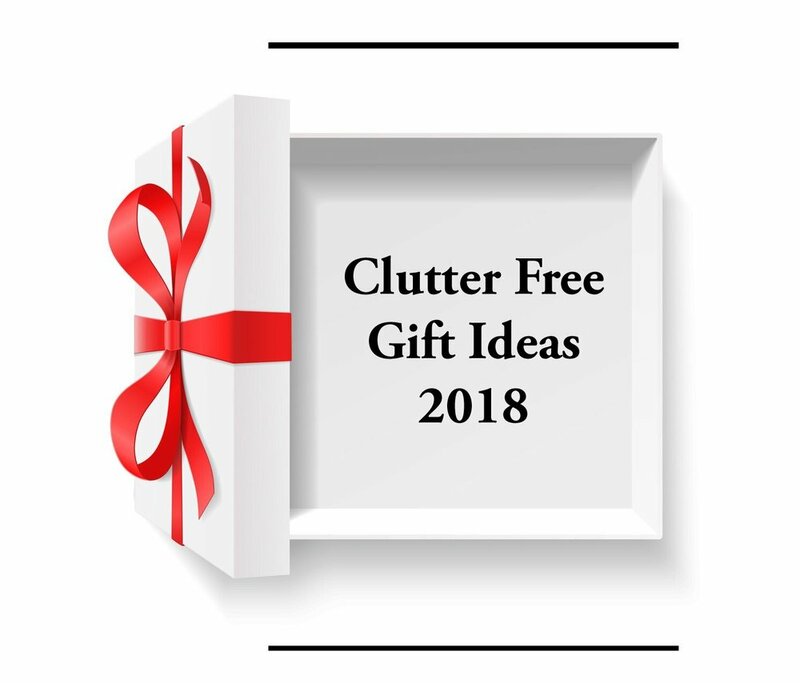 Here are some of my favorite largely clutter-free gift ideas to help you all achieve that goal. A couple of them actually take clutter away..
Disclosure: Some of the links below are affiliate links, meaning, that at no additional cost to you, I may earn a commission if you click through and make a purchase. These make great gifts because they can use year round. Perfect for people with or without children. Also nice they will always think of you when they use it. Experiences have the double benefit of creating a lifelong memory for someone, and generating some endorphins more than any package could. If you can afford it, make it an even better gift by doing it with them! Rent-A-Harley for a weekend? Nationwide locations. Amusement Park Season Passes - Right now is the best time to buy- it’s a steal! BMW Driving Experiences - Not for those on a budget, but REALLY cool. Of course, gifts that disappear gradually are also clutter free. These consumable gifts are not only clutter free, they keep on giving long after the holidays. Hamama makes seed quilts that allow you to grow delicious healthy supergreens on your kitchen counter in just a week. Gifts that keep on giving, but disappear monthly. On Amazon alone you can buy a monthly club for Hot sauce, Cookies, Olive Oil, Exotic Game Snack, Coffee. Flowers, Sausage/Cheese, Tea, Jelly Beans, Chocolate, Pizza, Gourmet Bacon, Fudge, Healthy Snacks. Give the gift of relaxation! Bath products are usually really pretty, smell awesome, and disappear with use! For your especially paranoid family and friends...A subscription to an identity theft protection service. Not cheap, but could save them in a big way if needed. To help you decide, here's a review of some of the major services. “Dang, I really didn’t want a massage gift certificate”. Said no one, ever. This is a can’t fail gift… Want to make it more unique? Suggest a style they may not have tried before--Thai, Hot Stone, Cranio-Sacral, Reflexology ...lots of options. I don’t know what I did before No More To Go came into my life. Every week a customizable menu comes to my inbox for every day of the following week and it generates a shopping list for me. What makes this service stand out and worth the monthly fee to me, is that there is so much variety, and every meal is delicious. Recently they’ve partnered with Amazon Fresh - with a click you can get the whole shopping list delivered. DNA testing companies like 23 and Me, Ancestry, and Family Tree DNA are offering holiday discounts on their kits. Find out where you're REALLY from, even get genetic health information. Give the gift of learning with the The Great Courses online learning program. Available in many price ranges and every topic you can imagine. Some are on sale for as much as 80% right now. Got a crafty friend? Or aspiring crafty friend? Crafting classes of all kinds-sew, quilt, photo, baking...all available online at sites like this Craftsy. This one will actually help them reduce clutter by giving them a way to deal with years of kids artwork. Artkive helps you digitize your childrens’ masterpieces and turn them into photo books and more. Yes, even the macaroni art. Use Promo Code: steponeorganizing and get $15 off your order. Many of us live in fear that our phone or PC will die one day, taking all our treasured photos with it. The Picture Keeper has the solution. Plug it in, all photos are saved. Yes. That simple. Give someone the gift of peace of mind about their photos. What about those generations worth of printed photos & videos? Buy a Legacy Box, fill it with treasures, ship it off. All come back to you preserved in digital form. They are currently running deals of 60% off. What clutter free gift ideas have you used in the past? Please share!